This is a perfect pole building for rural housing developments with horse property. It features approximately 280 sq. ft of enclosed area, pressure-treated posts and splashboard, painted steel siding in your choice of colors, open front design ready for stalls or gate panels (sold separately), and 8' walls,. 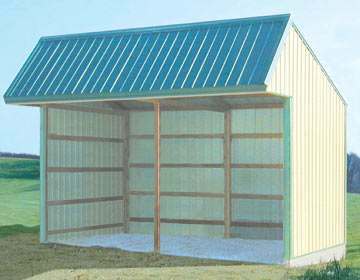 As with all Sutherlands building packages, all framing material and plans are included with this horse shed. For more information about horse sheds, pole barns, post frame garages, and other custom building packages, contact us today, or visit your local store.